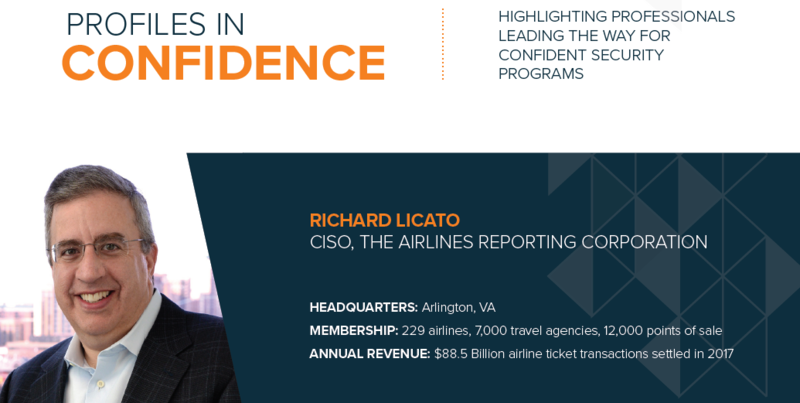 As CISO of ARC, Licato ensures the organization meets their mission, which includes driving air travel intelligence and commerce, providing business solutions and travel agency accreditation services, and processing financial management tools and data. Now over six years into his role, Licato has a clear picture into the organization’s operations and business functions, all of which are owned by eight major airlines. On building a program from the ground up, Licato states, “Three things I’ve always been taught are to take stock of where you are, where you want to be and have the ability to articulate how you’re going to get there.” Taking stock of where you are involves a great amount of self-evaluation, something Licato relied on his team to help understand. After engaging with the current team and gleaning valuable program information, Licato says creating a baseline using a framework must be done along with developing relationships with business leaders. Due to ARC’s security professionals taking on more responsibilities and functions, Licato’s team continues to experience significant growth. When Licato started at ARC his team had only a few people, which he has now grown to more than twenty members. On building a successful team, Licato says, “For me it’s about passion and intelligence. I’m looking for smart people who I can train in security functions. I’m looking for people who have an analytical nature and are always asking questions. Also, some level of skepticism sometimes works well in security.” Licato leads his team with openness and honesty, to encourage them to have effective communication. He does not micro-manage, but instead creates a safe environment with everyone on the same page.